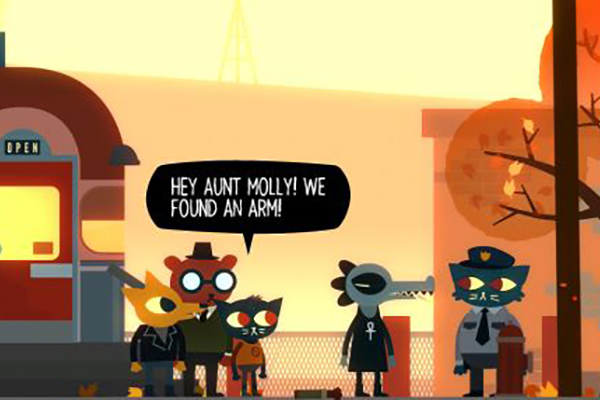 Night in the Woods is a game that appeals to narrative junkies and fans of Interactive Fiction. While the game is not perfect, it has a story and a cast of characters that are both memorable and enjoyable. I wasn’t sure how to break up this game review. I think the common method of reviewing games is becoming a bit dated and lacks a lot of the core analytical aspect that reviews lend themselves to. 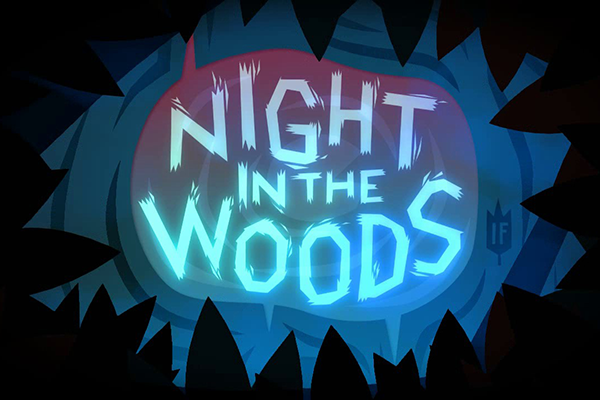 So I’m going to break Night in the Woods (NITW) into three core elements that pertain to how the game functions. NITW is a piece of Interactive Fiction. Well, calling it an “interactive narrative” would be more accurate, but all technicalities aside it is an interactive piece of fiction writing with other gaming elements, like some basic platforming mechanics. So I’ll refer to the game as Interactive Fiction under that pretense. And as such, the three elements I feel are most deserving of focus are going to be sub-divisions of the narrative: Characters, Story, and Tone & Voice. The tale of Night in the Woods is hard to describe. Largely because most of the elements that make up the actual plot appear in the last third of the game and ventures into major spoiler territory. Ultimately the game boils down to a coming of age story. We follow the protagonist, Mae, as she randomly returns home after leaving college for an unknown reason. The narrative contains elements of mystery, slice of life, and even some snippets of horror (albeit relatively minor). The worst aspect to the story is that it’s what I’d call a “slow burn.” The pacing starts off really slow, with very few things to keep you going outside of the questions the game poses to you and leaves unanswered. However, that is also one of the strongest aspects of the game. It leaves a lot of things up to you, the player, to get a grasp of and piece together. And ultimately what kind of story it is can largely come down to interpretation, which is awesome. 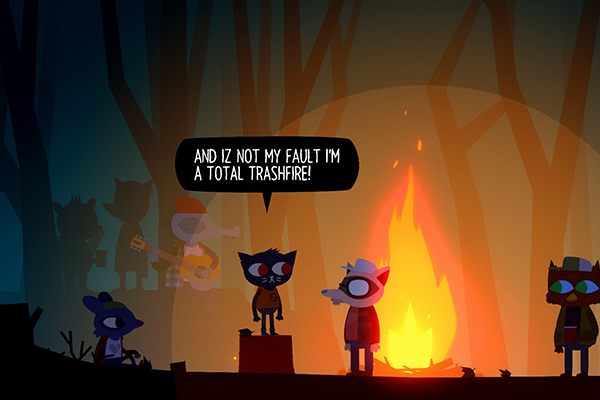 The story of NITW takes some patience to get into, but for those who can stick around that long it’s quite the treat. 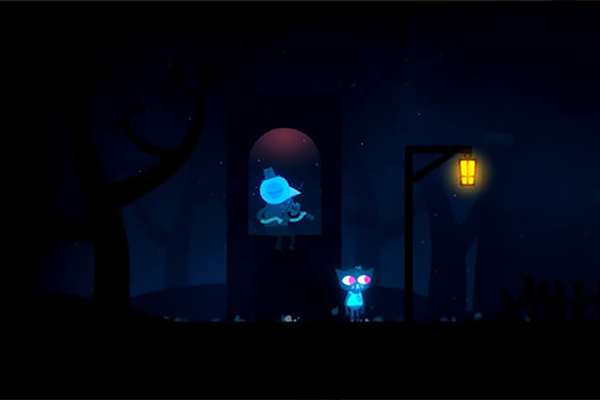 The characters within Night in the Woods are easily the strongest element of the game. Which is exactly what is needed for a story-driven game. The main characters we work with are Mae and her three friends: Gregg, Angus, and Bea. The four of them enjoy hanging out and do stupid things that young adults do, such as getting drunk and making a fool of yourself at a party. The characters are fun, relatable, and have a lot of depth to them. They all have struggles and things they want to do. Some want to get out of the dead-end town they live in and find a place where they belong. Others are dealing with mental illness. You don’t just interact with these characters, you get to know who they really are. And it’s not just the main quartet of characters that can draw you in either. Almost all of the side and background characters have something going on with their lives. They feel like actual people. Even if most of the changes the background characters receive is a bit of new dialogue or a small little backstory, it goes a long way to fleshing them out. You feel as if everyone you pass by are more than just filler NPCs. They’re people. And in turn, the town you jump around and explore every day is more than just a bunch of roofs and power lines to platform across. It’s a community and a character in its own right. This is where my inner writing critic comes out. Now, this wasn’t something that I noticed while playing the game, but it jumped at me when I looked back at it: the game has one voice and is very monotone. Normally a game being a bit monotone isn’t necessarily bad. But when the driving force of the game is your unique cast of characters, it can be a little jarring when everyone has the same wry and sarcastic tone. If the town, or community, is a character on its own then that character only really knows how to speak in sarcasm. There are some slight deviations on this voice from character to character, but it never changes enough to stand out as different. Granted, this kind of tone and voice could be deliberate for a specific thematic or literary reason. This game is packed with enough symbolism and metaphor for that to be very likely. And I’m all for the creator attempting something akin that. However, it did make the game fall a bit flat and make it boring early on. Ultimately, Night in the Woods is a great piece of Interactive Fiction with its fair share of problems. There is a lot to praise and critique about this game outside of the elements I discussed, but I felt like most of that is inconsequential in contrast to the aforementioned elements. As I said before, the game is a slow burn, like an ember. But it’s an ember that slowly ignites a brilliant blaze. I highly recommend this game to anyone who enjoys Interactive Fiction or who just loves sinking their teeth into a good story. Even narrative junkies who aren’t avid gamers could find something to love in this game. So if you know a bookworm who needs a good gateway game, I’d recommend this as a fantastic starting point.